Kolo Fortuny, as a Polish version of the original game, was very popular in Poland during the 1990s. The game was similar to its' original, with few differences. As first, the greater difference was the prizes amount. Unlike the original version, in Polish one you could win, for example, a dishwasher, or a vacation, at first only to hotels in Poland, and afterwards, to some more attractive destinations abroad. There was a toss-up puzzle to be solved, and 3 rounds of the game, and the bonus round in the end. After solving the Toss-up, the player gets to play the first round. The big vertically mounted wheel gets some new fields - 2x Wycieczka fields +AGD field. In case the player gets the AGD field, he can win some home appliances, like dishwasher etc, and in case of those two other fields, some vacation, of course, if he/she also chooses the right letter. If the wheel stops on wedge, player has to choose a consonant, and earns the amount selected for every appearance of that letter on the board. Then he has 10 seconds to solve the puzzle or to spin the wheel again. 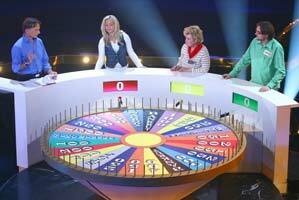 If the player wants to buy a vowel, he has to do it before spinning the wheel. The wheel has also some penalty fields, like Bankruptcy field and Stop field. Stop field just gives turn to another player, and Bankruptcy field costs the player all the money and rewards won in that particular round. In polish version, the player had only one chance to solve the puzzle, and he would loose the chance for bonus round if he would guess wrong. The prizes were much lower. The stage color was green, not blue.